25 Ways To Invest For Making Money Off Helping The Environment. Those of you who have been regular readers for a while might know that I run another site on environmental issues. Although I won’t mention the site, it’s not that hard to find as it is linked in my blogroll. 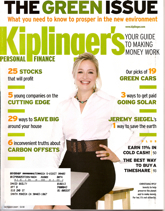 I just received the October issue of Kiplinger’s and it is the “Green” issue, with all sorts of articles about going green and making money, which can go hand in hand if done correctly. One article in particular stood out, as it was a list of 25 different companies that they think you should invest in in order to help make for a cleaner world. Who made the list? ABB – They sell power transmission equipment that reduces energy losses between power plants and the end-user. American Standard – Big time maker of HVAC equipment, they stand to grow quite steadily as people try to make their equipment more energy efficient with the newest and greatest available. Applied Materials – Wants to become a leader in the manufacturing of solar cells and film, so could do quite well in coming years. Burlington Northern Santa Fe – Seeing as how we will probably depend on trains more and more as fuel and transportation costs go up, these guys have a good chance of doing rather well. I think rail travel will eventually replace air travel for everyone other than the uber-rich, so they could capitalize on this as well somewhere down the line. Covanta – A leader in getting energy from trash, Covanta operates plants that burn trash and waste to make steam to run power generators. Excelon – The largest operator of nuclear plants in the country. FPL Group – A Florida utility company that produces 40% of the wind power in the U.S. Wind energy is going to take off around the world soon, so they should do rather well. General Electric – They make wind turbines, energy efficient engines, home appliances, light bulbs, etc.. It’s hard NOT to use a GE product in your everyday life. Honda Motor – The most fuel efficient car company on the planet…and that is saying a lot. I love Honda cars and know they will be strong innovators when it comes to upping fuel economy in the future. International Rectifier – These guys make the semiconductor power-conversion devices for both CFL and LED light bulbs, so you know they should be doing well in the near future. Itron – A leading supplier of utility meters in the U.S., making “smart” meters with timers. Johnson Controls – They invented the room thermostat in the 19th century, and they are still a leader in supplying temperature controls throughout the world. They also make long-life lithium-ion batteries, which will eventually be used in all hybrid vehicles. MEMC Electronic Materials – The leading supplier of silicon wafers for solar panels. Ormat Technologies – These guys are the third largest geothermal firm in the U.S.. Geothermal heating and cooling is the future, so they might be a good one to watch for. Philips Electronics – In a mass shopping spree, Philips is trying to acquire energy-efficient lighting companies. Combine that with their electronics division, and they are surely a powerhouse. Rohm & Haas – They make environmentally friendly sealants, coatings, paints, etc.. I just recently painted my home office with environmentally friendly paint, and not once did I smell that familiar paint smell. Painting was never so pleasant! Shaw Group – Builder of nuclear and “clean” coal plants. I put “clean” in quotes because I can hardly believe there could ever be a real “clean” coal burning plant, but maybe they are on to something. Sunpower – Makers of the most efficient solar panels, they stand to do very well. Suntech Power Holdings – China’s largest maker of photovoltaic cells, should be able to make low-cost solar equipment on a mass scale internationally. Tenneco – Maker of automotive emissions equipment. With stricter emissions laws being put in place around the globe, they could so some booming business. Trinity Industries – The largest manufacturer of rail cars. As train use goes up, they will see even more business. United Technologies – Maker of efficient HVAC equipment, elevators, fuel cells, engines and helicopters. Anything efficiency related should do well. Zoltek – Big time maker of carbon fiber, which will be used more and more on planes, cars, etc. to make them lighter. Although I am no financial genius and this list should not be construed as my advice, I must say that they assembled a pretty decent list of companies that should do well as the green movement gets bigger. I would have to add Toyota to the mix, as they success of they Prius has been huge. I don’t think these articles are available online yet, but if you are interested in checking out a lot more info about these companies, along with their financial information, you should check out the latest issue. I think I read an article sometime ago in Fortune comparing “socially responsible” funds that invested in companies like these, and Fortune’s conclusion was that they don’t make money very well. I guess it makes sense since a lot of green energy companies pour in a lot of money for research and development and don’t necessarily make a profit. I think it’s funnier to make a lot of money in oil companies and then and donate the stocks to organization trying to make the world a cleaner place. A lot of people do it that way as well! the award-winning publication, The GreenMoney Journal. I enjoyed this month’s Kiplinger’s focus on being green. I thought they had some great articles. While I’m very pro environment, I’ve never found socially responsible investing to make that much sense (unless you’re trying to actually gain enough shares to exert control). Buying shares does nothing to actually support what a company does. Green consumption is far more important. Support companies that are environmentally conscience by buying their products, and boycott companies that are destructive to the environment. True Dong, but the more people that care about the environment AND own shares, the more pull they have on what the company does!